Quarry Springs just announced the relaunch of its estate condominiums in Bethesda, Maryland featuring exclusive enhancements both inside and out, as well as an onsite sales center to showcase five-star luxury amenities. 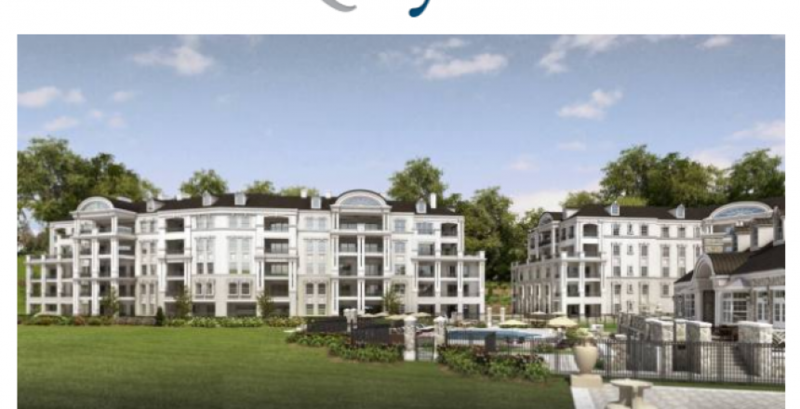 Located at 8101 River Road with easy access to I-495, Washington, DC, and Tysons Corner, Quarry Springs offers 50 residences in two boutique buildings now under construction with top out in December, and with clubhouse completion scheduled for November. Convenient to downtown Bethesda, Potomac Village, The Collection at Chevy Chase, Georgetown, C&O Canal, and Congressional, Bethesda and Burning Tree Country Clubs, Quarry Springs offers front-to-back views within open floor plans that range from 2,200 to more than 4,500 square feet, in addition to sprawling wraparound outdoor living spaces. Even more refined with modernized, classic interior design and expanded baths and kitchens, Quarry Springs two- and three-bedroom residences offer private garage-to-foyer elevators, 10-foot ceilings, premium wide plank hardwood flooring, vented gas fireplaces with stone hearths, spa bathrooms with Waterworks fixtures, and top-of-the-line, larger-than-before kitchens including Wolf six-burner cooktops, convection ovens, Sub-Zero refrigerators and wine coolers, and solid wood cabinetry in select styles and colors, as well as a variety of solid stone counters. Additional enhancements include climate-controlled storage areas, multi-port multimedia taps for audio and video, recessed and accent lighting, contemporary base moldings, and in select units, the new options to add wet bars and exterior fireplaces. Nestled within the former Stoneyhurst Quarry where mica schist was sourced for close to a century and used for Washington, DC-area homes, bridges, churches and other landmarks, Quarry Springs offers rich community amenities starting with its elegant clubhouse with library, catering kitchen, game room, Grand Salon for formal gatherings, and a full bar/lounge for a more casual atmosphere. The 6,000-square-foot fitness center includes a yoga studio, while the spa offers a steam room, sauna and shower facilities. Sculpted grounds, winding walking trails, and a dramatic 50-foot, three-tiered waterfall with a stream that meanders along the 13-acre sanctuary collectively enhance the central resort-style outdoor pool. Quarry Springs also includes concierge services, valet parking for both residents and guests, 24-hour access monitoring and a full-time guard attendant within the gated community, which is designed by Robert M. Swedroe Architects & Planners and Trimbach, built by James G. Davis Construction Corporation, and developed by 1788 Holdings and IHP Capital Partners, “Homeowners who seek the luxury of an estate-style home with direct-access entries along with the conveniences of an all-inclusive condominium setting featuring high-end indoor and outdoor amenities will be attracted to what Quarry Springs has to offer,” says TTR Sotheby’s International Realty’s David DeSantis, who, along with Christine Basso, is presenting Quarry Springs residences. For more information about Quarry Springs including pricing and to view all the available floor plans, contact Sherry Moeller, [email protected], 301.807.0910.